Ever feel like the text or pictures on your computer screen are simply too small? Maybe the text isn’t large enough to read comfortably or the details of a picture too hazy. 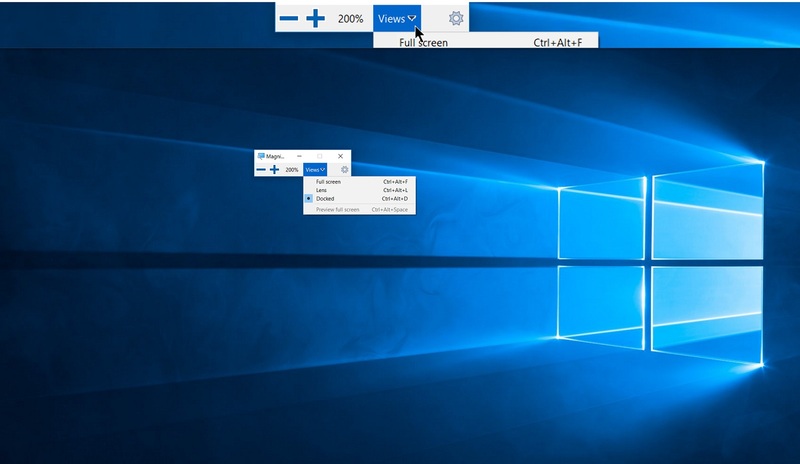 Whether you have 20/20 vision or vision impairment, Magnifier in Windows 10 allows you greater control over how well you can see when you’re at your computer: use this tool to enlarge specific words and images, or your entire screen. Let’s get started. To quickly turn Magnifier on press the Windows key + Plus (+). This control is always at your fingertips, allowing you to use Magnifier as needed. Want help on a permanent basis? Keep Magnifier on permanently by going to Settings > Ease of Access > Magnifier and switch the Turn on Magnifier switch to On. Once Magnifier is open you can quickly adjust the size of the words and images on your screen by using Windows key (+) to make them larger, and Windows key + Minus (-) to make them smaller. The Magnifier Window allows you greater control over the type of Magnifier view you prefer. It appears as soon as you turn Magnifier on. When the Magnifier Window appears, the Magnifier icon simultaneously appears in your taskbar. If at any time you lose track of the Magnifier window, you can click the Magnifier icon on your taskbar to bring it back to your current screen. You can change the Magnifier View by selecting it from the Magnifier Window. Choose one of three options: Full screen, Lens, or Docked. Let’s discuss each of them: Full screen enlarges the entire screen. Because everything on the screen is larger, only part of it is visible at a given time. However, you can choose whether the enlarged section follows your mouse pointer, the up/down arrows on your keyboard, the text insertion point, or your Narrator cursor, by going to Settings. Lens view is like moving a magnifying glass around the surface of your screen. You can enlarge the area directly under your mouse pointer for a view of a precise section of your screen. In Docked, the area directly under your mouse pointer is magnified and shows up in the docked section at the top of the screen. Below the docked section, the rest of the screen remains un-magnified so you can see your text or image within the context of the rest of the screen. Magnifier also allows you to specify zoom levels and zoom increments. Go to the Settings in Magnifier to locate both options. Change zoom level allows you to control how much larger or smaller your selected text or image will appear (from 5% all the way up to 400%) using the plus and minus keys. Change zoom increments allows you to control the zoom in increments of 25%, 50%, 100%, all the way up to 400%. Just use the dropdown menu to set your preference. Looking for Magnifier shortcuts? Look no further: Find additional shortcuts and other accessibility features on our Windows keyboard shortcuts for accessibility page. Using Magnifier can make the words and images appearing on your screen easier to see, and the time spent in front of your screen that much more comfortable.